Russian pedagogue and author; born at Mitau Sept. 12, 1812; died there Aug. 16, 1868. He received the usual Jewish education under a private teacher, and at the age of eighteen entered his father's business. In 1834 he married, and, having lost his fortune, supported himself as a private tutor. At the beginning of the colonization movement inaugurated by Czar Nicholas (see Jew. Encyc. i. 252), Wunderbar wrote an address to the colonists who went from Courland to Kherson ("Betrachtungen über die aus Kurland nach dem Cherson'schen Gouvernment Auswandernden Israelitischen Kolonisten-Familien," Mitau, 1840); this address attracted the attention of Max Lilienthal, who appointed him teacher at the Riga school under his management. After Lilienthal had been called to St. Petersburg, Wunderbar acted temporarily as principal of the school and as rabbi. In 1848 he was called to Mitau as teacher of religion and as Hebrew interpreter to the government, acting occasionally as rabbi also; this position he held until his death. 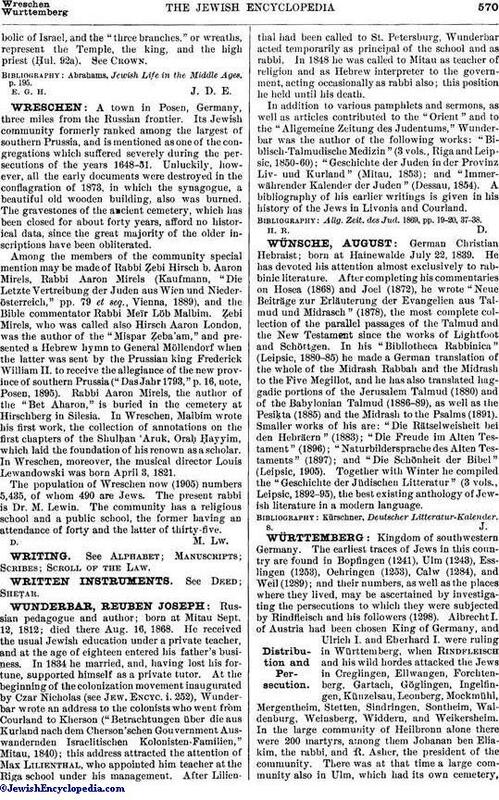 In addition to various pamphlets and sermons, as well as articles contributed to the "Orient" and to the "Allgemeine Zeitung des Judentums," Wunderbar was the author of the following works: "Biblisch-Talmudische Medizin" (3 vols., Riga and Leipsic, 1850-60); "Geschichte der Juden in der Provinz Liv- und Kurland" (Mitau, 1853); and "Immerwährender Kalender der Juden" (Dessau, 1854). A bibliography of his earlier writings is given in his history of the Jews in Livonia and Courland. Allg. Zeit. des Jud. 1869, pp. 19-20, 37-38.